Did you know that most airlines allow free stopovers? Stopovers (or layovers) are one of the best ways to visit a second place for free. While most people try to avoid layovers and prefer to fly direct, I see them as a bonus. The only caveat is that you’re a bit limited on the second place you get to visit. If you’re planning to spend thousands of dollars on a flight to Fiji, why not go to New Zealand or Australia too (and at no extra cost for the flight). Why not visit Iceland on your way to Europe? You could even spend a few nights in Las Vegas on your way to Cancún. Most flights have a connection. The key to finding out if you can get a free stopover is to look at what cities your flight stops in, as well as looking for further destinations with a stop in your destination city. Airports work in a hub and spoke type system. Major airports are the hubs, and smaller airports connect to the hub like a spoke. So if you want to go from one small airport to another, you’re most likely going to have to connect through a hub airport. Think of it like this: If you want to go from Los Angeles to London, but there is a connection in New York, then you can simply book the flight via Multi-City from: Los Angeles -> New York -> London, with a few days (or weeks) in New York. Alternatively, if you’re going from Los Angeles to New York, you might want to see if there is a flight to London with a stopover in New York. Then you can treat the New York trip as your free stopover, and London as your destination. This would also work for your return journey. Let’s say you live in New York, and want to go to London. If you fly on Iceland Air, you can book a stopover in Reykjavik for the same price. 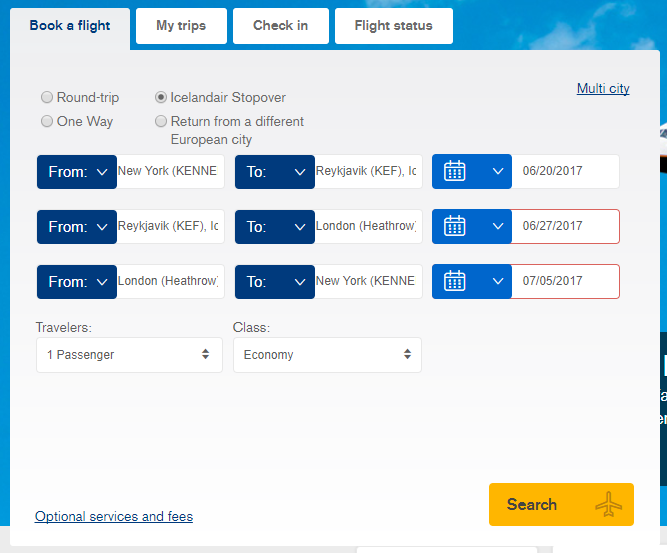 Iceland Air makes this really easy by having an option for the free Icelandair Stopover, but the process is really the same on all sites. It’s just named “Multi City” or “Multiple Destinations”. Surprisingly, in my example, I looked up the same flights, but with a stopover on one of them. The price with the stopover was actually lower than flight without. You’ll also notice that it has an eight-hour layover in Reykjavik anyways. Why not take some time to see Iceland and enjoy bathing in the incredible Blue Lagoon Pools? 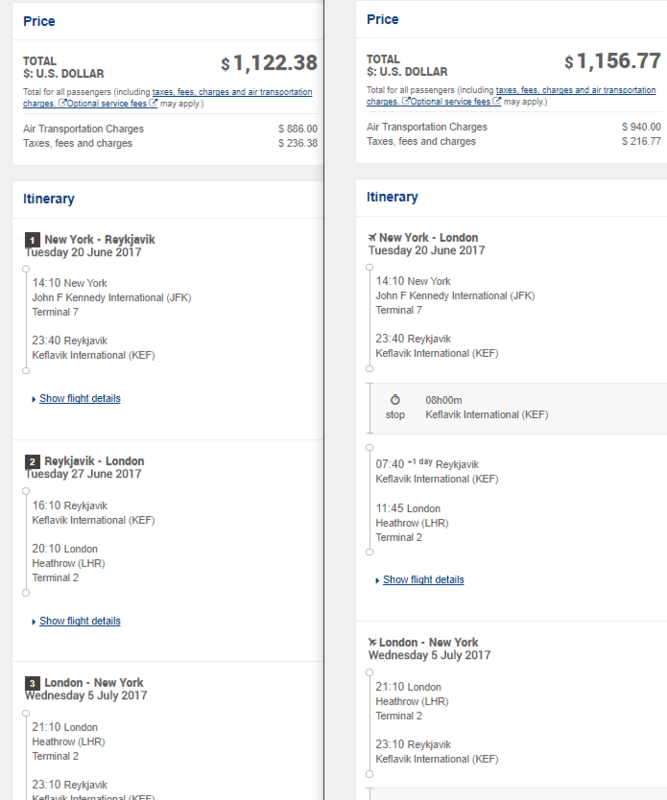 In the screenshot below, the free stopover was on the left, and the direct was on the right. What Airlines offer free stopovers? There are a surprising number of airlines that offer free stopovers. 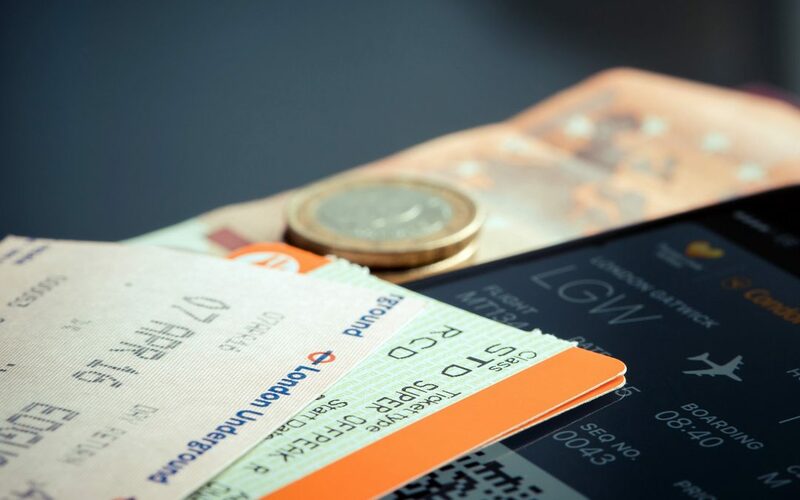 Unfortunately most airlines do have different policies on what flights are eligible for a free stopover, and how long they can be, but it doesn’t hurt to look. If you have any questions, please leave them in the comments and I’ll try to respond! If you learned something new, please share this post so others can learn too.